The SBU says he "drank his conscience off". 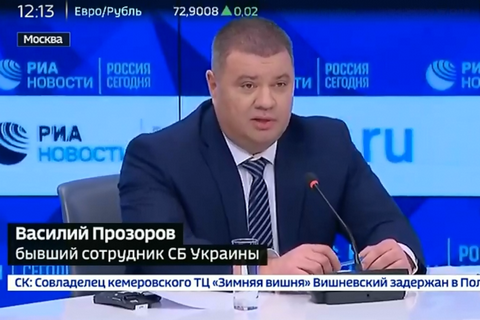 The pro-Kremlin Russia Today media group has hosted a news conference by a "defector from the Security Service of Ukraine" (SBU), Vasyl Prozorov, in Moscow. "My name is Vasyl Mykolayovych Prozorov. From 1999 to 2018, I was an employee of the Security Service of Ukraine. Since May 2014, I had worked in the central office, namely in the antiterrorist centre of the SBU. For ideological motives, since April 2014, I had absolutely voluntarily provided assistance to the Russian special services in obtaining information about Ukrainian uniformed agencies' activities, in particular in the antiterrorist operation area," the man was shown say. He claims to have had access to the most highly classified information on the antiterrorist operation in Donbas and personally attended closed-door meetings of the National Security and Defence Council. The SBU press service confirmed that the man had indeed been employed by the service. "Vasyl Prozorov was dismissed from the post of a senior expert consultant of one of the departments of the Antiterrorist Centre HQ of the SBU for inaptitude, in particular for systemic consumption of alcohol in his workplace and because he discredited his officer's rank. Having drunk his officer's dignity off, Prozorov decided to trade in his conscience and military oath, having found 'decent people' in the Russian FSB," the SBU said on Facebook. The SBU called him a traitor repeating "old fakes" and reminded him about "Judas's fate". The SBU marks its professional day on 25 March.